It is funny how 1 problem leads to another, but if you work at it hard enough the solution to both can lead to so much more. In 2008 when we began making templates for Longarm quilting, it quickly became obvious that quilters had difficulty stitching around the outside of circles and other shapes. I have always believed that it is much easier to draw inside a shape than around the outer edge. So we designed our templates to be stitched around the inside. This left another problem, longarm machines could not entre the inside of the template. The answer to this problem was the invention of the unique Westalee Design Key System, a key that when removed allows the ruler foot to be placed inside the template, when the key is replaced the opening is closed and the quilting line can be sewn without any unsightly flat spots. These templates will create a variety of designs that can stand alone or be used to offset and echo a specific design. 4) You may also use the dashed etched markings on the template to echo and / or offset your design (see A) by lining up the template on the stitch line you just made then use the selected etching on the template to create the echo or offset design. 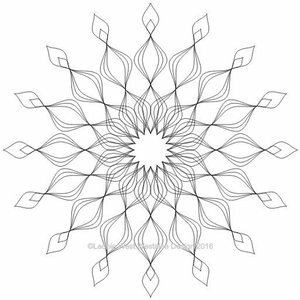 Our Artisan Curve Template can be used to create many different quilting designs which use a Circle Base, such as Baptist Fans, Mandalas and many more. You can use 1 template or as many as you desire and we have many designs to choose from. The Artisan Curve Templates will stitch up to an 18" diameter circle at 1/4" intervals. Artisan Curves have been designed to be used with marked reference lines, using our Stitch and Rotate Quilting Method. The Artisan Curve templates can be used with any of our Rotating Templates to create your own unique quilting designs. As with all of our templates, our Artisan Curve Templates are made Machine Specific. They are cut to 3 different thickness's to suit the Machines Shank and Make. The templates shown are for both Long Arm Machines and Domestic Sewing machines. Size Please Choose 1/4" 1/2" 1" 1 1/2" 2" 2 1/2" 3"
Template Size Please Choose 20- .5"x3" 21- 1"x3" 22- 2"x3" 23- 3"x3"
Template Size Please Choose 90- .5"x.5" 91- 1"x1" 92- 1.5"x1.5" 93- 2"x2"
Template Size Please Choose 40- .5"x3" 41- 1"x3" 42- 2"x3" 43- 3"x3"
Template Size Please Choose 10- .5"x1" 11- .75"x1.5" 12- 1"x2" 13- 1.25"x2.5" 14- 1.5"x3" 15- .5"x1" 16- .75"x1.5" 17- 1"x2" 18- 1.25"x2.5" 19- 1.5"x3"
Template Size Please Choose 70- .25"x.5" 71- .5"x1" 72- 1"x2" 73- 1"x2.5" 74- 1"x3" 75- 1.5"x3"
Template Size Please Choose 60- .25"x.5" 61- .5"x1" 62- 1"x2" 63- 2.5"x2.5" 64- 1"x3" 65- 1.5"x3" 66- 2.5"x3"
Template Size Please Choose 30- .5"x.5" 31- 1"x1" 32- 1.5"x1.5" 33- 2"x2" 34- 2.5"x2.5" 35- 3"x3" 36- .5"x3" 37- 1"x3" 38- 1.5"x3" 39- 2"x3"
Template Size Please Choose 50- 1"x1" 51- 1.5"x1.5" 52- 2"x2" 53- 2.5"x2.5" 54- 3"x3"
Handi Quilter HG00605 Swag Ruler Template Set 4"
Handi Quilter HG00619 Ruler Template C Oval Sizes 8x4" and 12x 6"
Handi Quilter HG00603 Ruler with 4-Mini Circles 1/2" 3/4" 1" & 1-1/2"